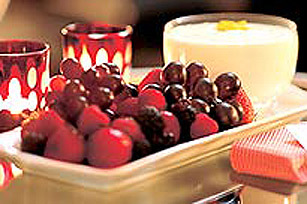 Fresh fruit tastes even better when it’s dipped into this easy fruit dip made with yogurt, orange and whipped topping. With only 10 minutes of prep, this fruit dip is perfect for effortless entertaining. Mix together 1 cup plain yogurt, 1/4 cup each sugar and orange juice and the grated peel from 1 orange. Fold in 2 cups thawed Cool Whip Whipped Topping.Covered and chill in refrigerator until ready to serve.